We confess that we have never done the DNA thing, mitochondrial or otherwise. We have never done it for our health, never had it done to us by the crime squad, never done it for genealogy. It is a lacuna in our experience, a failing of our courage. Somehow, we are squeamish at the thought of an anonymous lab tech knowing the deepest secrets of our inner workings, of our body's ancestral memory (how very Jungian) to a greater extent than we do ourself. Yet it would seem that exactly that will happen anyway, even if we are never tested but if some of our nearest and dearest start submitting their hair follicles for analysis. Apparently, if enough relatives have their genes sequenced, our own sequence can be deduced without us ever going near a genetic testing company. We have learned, with an increasing gloominess, that utter strangers may pounce on us to announce that they know our sequence and it means that we must be related to them. What a nightmare! To paraphrase Brad Templeton, it seems that there are so many genetic testing companies with databases to connect people via their DNA, that such messages from ersatz cousins are, for some, almost spam. The craze to have one's DNA sequenced in order to verify one's genealogy has not achieved the same intensity in France as it has done in the United States, but it is definitely on the increase. Unfortunately for them, this has been illegal in France since "the law of bioethics" was passed in 1994. Recall that we are in the region where people lived under the Nazi horrors and the thinking here is that genetic testing can edge mighty close to racial testing and the creation of a mass of data about citizens' racial backgrounds could lead to the same old trouble. 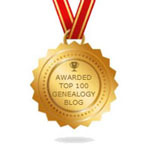 Nevertheless, those with short memories or dreams of the perfect genealogy have found a way around the law: as the test is usually via a kit sent in the post, it is easy to use a foreign company. (See this TF1 news clip.) We give here the two companies most used by the French for any of you who wish to try this avenue to bump into one of yourFrench relatives alive today. iGenea - is a Swiss company. Their website is multi-lingual, with a page in English. Their basic package costs 79 euros. We like that the some of the directors post their haplogroup paternal and maternal lines. The "I'll show you mine if you'll show me yours" sales pitch. They are preferred to FamilyTreeDNA (who do not produce reports in French). International Biosciences are a British company but they do have a French language page. Their starter pack costs 169 euros.